“I suppose you know what this call is about,” said the voice on the other end of the phone. “Frankly, no, I don’t!” was my instant reply. The call came unexpectedly from Governor Jay Nixon’s office in late September. To say that it shocked me is a major understatement. 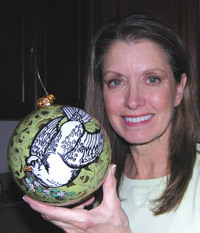 In 2010, I was asked to design the ornaments for Missouri’s tree at the National Christmas Tree Lighting ceremony and display in Washington, D.C. It was a once-in-a-lifetime honor and I was thrilled to be “the” artist given that task. In 2011, when I was asked a second time, I could hardly believe it. But now, in 2013, I pinched myself to comprehend that this honor has come a third time. Oh, wow, oh, wow, oh, wow….I sank into a chair and let it all sink in, my mind already swimming with design ideas. The National Christmas Tree grows in President’s Park, just behind the White House in Washington, D.C. Decorating and lighting the tree is the longest continual tradition that the White House and National Parks Foundation host each year (it was decorated but not lighted during WWII black-outs, and delayed in 1963 following President Kennedy’s assassination). Surrounding this big tree (believe me, it’s a BIG tree!! ), are 56 smaller cut trees to represent each state and territory (Can you name all of the U.S. territories? Answers at the end of this column). One artist from each is selected to create the design; one school from each is also selected as “artist’s assistants” to replicate the design. I love working with these budding artists! It always amazes me to see how they happily rise to the task. Kirkwood High School was chosen this year. Working with teachers Nancy Grimes, Leslie Benben and their students was delightful. I designed the project to have many stages, allowing as many students as possible to put a hand on this important project. A total of 114 students had a part in the creation of 23 ornaments, and every one of them did a remarkable job! We finished all the ornaments in one very busy day. Because the tree is outdoors, these ornaments must withstand whatever the Potomac River and winter deliver, be it rain, snow, sleet, wind, sun or ice. So, the large plexiglass spheres were reverse-glass painted. That means all the painting had to be done on the inside of the spheres and in reverse: details painted first, lettering painted backwards, etc. Oh, and the surface is rounded and convex. Not easy!! This year, Missouri’s ornaments feature a dove, symbolizing the wish for peace—on a local, state, national and international level. Instead of the traditional olive branch, however, this dove clutches a dogwood branch and a hawthorn branch (Missouri’s state tree and flower). Let peace begin right here! The back of the ornament proudly spells out Missouri, with the “M” partially formed by our Gateway Arch, a National Parks monument. Wrapped around the Arch and underlining the state is a colorful strand of holiday lights. On the bottom of the ornament, “2013” will tell future generations which year these works were made. All of this is set on a background of lime-green swirls on gold to symbolize the richness of Missouri’s natural beauty in a contemporary way. Hand-curled golden wire tops each ornament with a bit of whimsy. As this is written, the ornaments have been boxed and shipped to Washington, D.C. On December 6, with 30,000+ people in attendance and millions watching on live television, President Obama and the First Family will light the National Christmas Tree plus all 56 of the surrounding trees (have you named the territories yet?) to officially start the holiday season in our nation’s capital. Entertainment by a lineup of great musical performers rounds out the festivities. It’s amazing to see this event from the “other” side: Although the evening program begins at dark, we guests must arrive very early in the afternoon to pass through the most stringent security possible. The event is outdoors… in the cold….in the wind…waiting for hours…and not minding a minute of it. I’ll be freezing, but smiling, excited to be part of it all, especially this year on my birthday! As always, whatever tradition you celebrate at this special time of year, may yours be happy and filled with wonderful memories to keep your heart warm all winter long. The six U.S. Territories are: American Samoa, Guam, North Mariana Islands, Puerto Rico, Virgin Islands, and, of course, the District of Columbia itself. This entry was posted on Wednesday, November 27th, 2013 at 11:45 pm and is filed under December 2013. You can follow any responses to this entry through the RSS 2.0 feed. Responses are currently closed, but you can trackback from your own site.